The Partition war was an “organic” generational crisis civil war between Hindus and Muslims. That is, it came up from the people, rather than coming about because one nation invaded another war. In fact, the leading Hindu and Muslim politicians of the day were in a state of denial, and were caught completely by surprise, and hadn’t expected the war to occur at all. And most of the “organic” slaughter was centered in the provinces of Kashmir and Jammu. The crisis civil war was settled with a compromise: Kashmir and Jammu would be split into separate regions governed by Pakistan and India, respectively, separated by a Line of Control (LoC). Today, with India and Pakistan again in a generational Crisis era, the leading Hindu and Muslim politicians are once in a state of denial, not realizing how dangerous the situation is, and how a new, bloody, massive “organic” civil war could begin in Kashmir once again. Pakistan celebrated Independence Day on Sunday with commemorative ceremonies held in Islamabad, Pakistan’s capital city, as well as at the Pakistan High Commission in New Delhi, India’s capital city. In Islamsbad, the day began with a 31-gun salute in the federal capital along with a 21-gun salute in each provincial capital. Flag hoisting ceremonies were held in the provincial capitals and district headquarters. The main ceremony of the day was held at Islamabad’s Convention Centre, where President Mamnoon Hussain and Prime Minister Nawaz Sharif hoisted the national flag. Nawaz Sharif opened the hostilities by announcing, “I dedicate this year’s 14th August to the freedom of Kashmir.” By “freedom,” he means that the Indian-controlled portion of Kashmir should be given to Pakistan, something that would not happen without a major war. The only outstanding issue is how to liberate parts of J&K under illegal occupation of Islamabad. As far as Jammu and Kashmir is concerned, we are dedicating this year’s Independence Day to the freedom of Kashmir. And we firmly believe that the sacrifices made by the people of Jammu and Kashmir will not go in vain. Our stand is very clear in the context of the J&K issue. If at all there is any outstanding issue with Pakistan, it is only on ways to liberate parts of the state which remain under the illegal occupation of Islamabad and make them a part of the Union of India. Nawaz Sharif said that he is waiting for Kashmir to be handed over to Pakistan, he even wrote to UN Secretary General regarding this. I want to assert that no power in the world can wrest Kashmir from us. And if at all they want to have a dialogue with us, then we are ready. But it will be about Pakistan occupied Kashmir, not Kashmir. 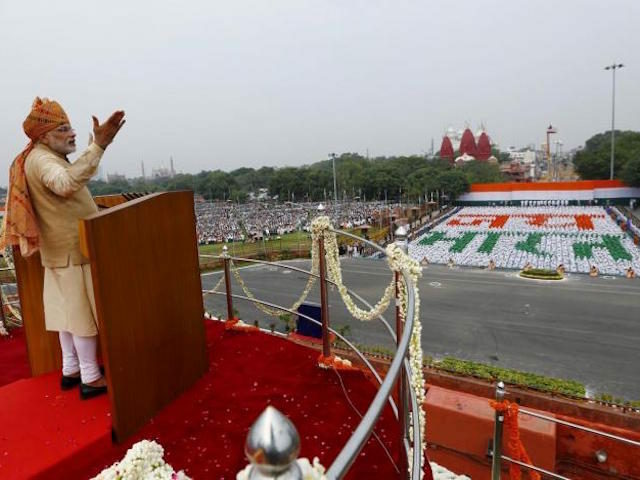 On Sunday, India imposed a curfew in all major towns of the Indian-controlled portion Kashmir and Jammu, in order to prevent widespread celebrations of Pakistan’s Independence Day, but the celebrations occurred anyway. Large pro-Pakistan rallies were held in several towns in southern Kashmir on Sunday. 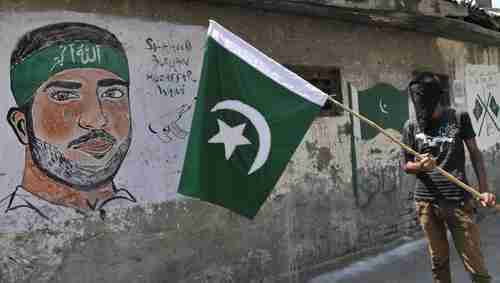 Militants from Hizbul Mujahideen hoisted Pakistani flags and saluted them.